If you took all the movies throughout history about a ragtag group of rebels fighting off the mighty British Empire, you could probably fill a small library. 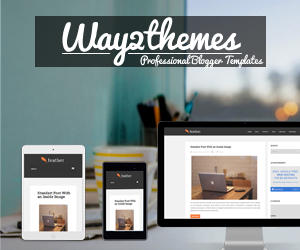 It's a popular theme, with many cultural variations to keep things from getting boring. But its prevalence also makes originality difficult. After all, what was The Patriot if not Braveheart set in America? So for Ken Loach's 2006 Cannes Palme D'Or winner, The Wind that Shakes the Barley, to be such a unique and singular work, is something special indeed. 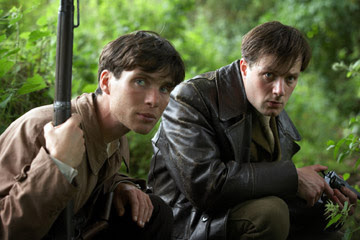 Set in Ireland in 1920, The Wind that Shakes the Barley is, on the surface, a tale of the Irish rebellion against the British, and the radicalization of a young doctor (Cillian Murphy) as he joins the IRA to drive the British from their homeland and establish a free Irish state. But what Loach creates here is not a mere historical document; instead he draws very clear parallels between the Irish rebellion and the current Iraq war - a band of guerrilla fighters fighting against an occupying force who labels them terrorists. It's a disturbing and thought provoking parallel, and it gives the film an immediacy that, even though it takes place 87 years ago, makes it urgently and vibrantly current. Not only does it lend the film topicality, but it makes it much more readily identifiable. Their situation is not so different from one we find ourseleves in today, and a tale nearly 90 years old suddenly seems as current as the nightly news. He allows us to see our world in theirs, and they no longer seem so far removed. That would have been enough to make a very good movie. But Loach takes it a step further. 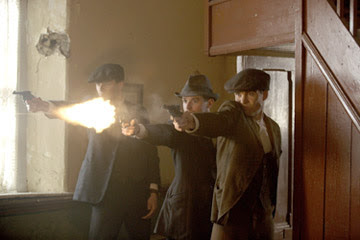 The film takes a third-act turn after the British reach a compromise with the Irish to set up an independent Irish state that still swears an oath of allegiance to the crown. This causes unrest within the IRA itself, with many taking the compromise, while others view it as selling out. The result is brother turning against brother, a war of moderates versus radicals that the film takes its first ambivalent stance on. It has undeniable socialist sympathies, but the final message of the film is ambiguous. Was it right to reach the compromise? Is that what their comrades had fought and died for? Or had they in essence sold their souls to the devil to save their own skins? And what happens when those in power become the very thing they had fought against? It becomes Animal Farm populated with people. 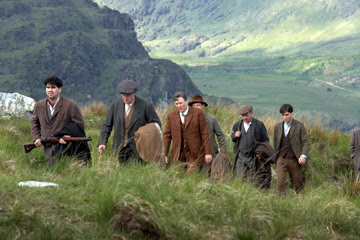 Loach, along with cinematographer Barry Ackroyd, shot the film in an almost documentary-like style, adding to the film's naturalistic tone and stunning realism, and makes great use of the breathtaking Irish countryside. The often peaceful but ever present nature reminds of not only what these men are fighting for, but serve as a sharp contrast to the senseless violence. In a place surrounded by so much beauty, so many horrors are committed by human beings. It's one of the many points to ponder in The Wind that Shakes the Barley, one of the richest cinematic feasts I have seen in a while. It is a powerful, haunting work, and a dire warning of history repeating itself. The idea that one man's terrorist is another man's freedom fighter never rang so true.